Earn 125 loyalty points when you order this item. The Sort Kone is a sophisticated resonance control device, directly coupled and mechanically tuned - this BC (bronze/ceramic) version features a bronze post and base elements combined with a ceramic coupling ball. Supplied as a single Kone, they can be used in triplets, quartets or even larger numbers. Why use a Sort Kone? 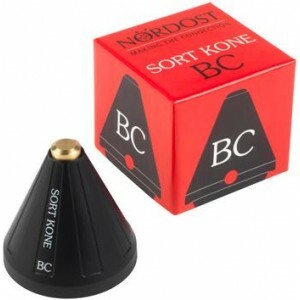 "Sort" is Danish for black, which is exactly what the Sort Kones provide - a blacker background to your music. With it comes greater focus, instrumental color, depth, transparency and dynamic range. Your system will sound more natural and more lifelike, your music more lively and engaging, the musicians like better musicians - simply because you’ll finally be able to hear the notes they’re playing, the way they play them and precisely when. So, release the hidden performance that’s lurking in your equipment. Whereas most equipment supports are referred to as Isolation Devices, this actually completely misunderstands the nature of the problem. The most harmful mechanical energy doesn’t enter the equipment from outside, it’s generated internally by the audio circuits and their power supplies. Transformers, power supply capacitors, even the active devices themselves, all vibrate as they operate - and those vibrations occur right where the fragile signal is, creating timing errors that smear and distort the music. The Sort Kone is designed specifically to deal with this threat to audio fidelity. - Three-part construction employs superior materials in a mechanically tuned configuration. - Bypasses soft equipment feet in order to provide direct mechanical ground path for internal energy. - Upgrades performance of existing racks and support systems.